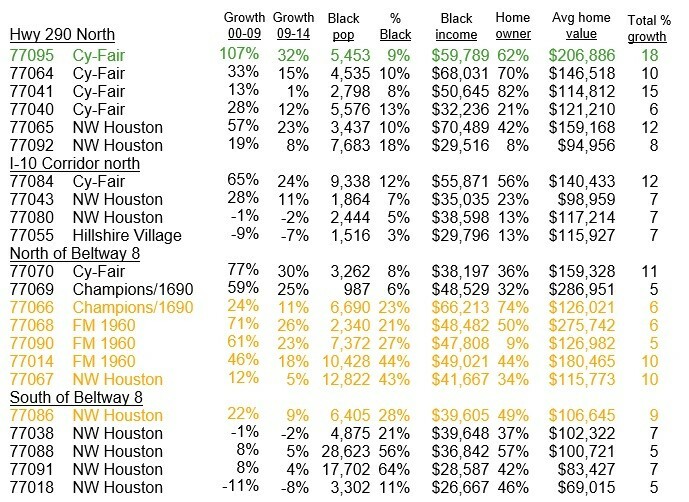 Northwest Houston has seen tremendous growth in its Black population in recent years. It is currently home to 150,000 African Americans which make up 19% of the total population. The most popular locations for relocating African Americans are the communities along the FM1960 corridor commonly referred to as 1960. These neighborhoods have a good mix of family types and lifestyles. The demographics include middle aged empty nesters, young families looking for a better life, people in transition who recently divorced, changed careers, or graduated from college. Incomes range from lower middle to upper middle. FM 1960 is a wide and very busy commercial strip that runs from highway 59 northeast to I-45N. The area south of FM1960 is a neighborhood in transition and has an increased African American and Hispanic presence that is very noticeable. The area north of FM1960 is also seeing increased ethnic populations, many of which are African American. Black growth here is in the double digits and continues to just south of the Beltway. School districts in the area which include Cypress-Fairbanks and Klein have very good reputations compared to much of HISD. Much of the Black migration here comes from the older north Houston communities south of the Beltway such as Acres Homes, Independence Heights, Aldine, and Northline. Those who value convenience and education are attracted to this area. Large numbers of African Americans live further south in the older Black communities of Acres Homes, and Independence Heights which have seen little recent growth but fare better than most other older Black neighborhoods.